In the last week, the Forums are not "remembering" which posts that I have previously read; consequently, the unread posts listings are growing very long. I am logged in as garioch7. I have never encountered this issue before in the many years that I have been a member here and have visited daily. Running Windows 10 Pro x64 (Build 1803 - fully patched). Browser is the current version of Google Chrome. There was a previous issue with my Bitdefender 2019 Total Security stopping me from accessing this website, but that was resolved about a month ago. Not sure if that might be the cause. Would you be so kind as to check at your end and make sure that my account is OK? If my account is OK, then I will have to try to figure out what software on my computer is messing with the "memory" of what I have read on your Forums. Checked your account and nothing stands out. FYI, there is no setting related to this for accounts. I suggest trying to clear your browser history and seeing if that makes a difference. Let's see if other users report the same issue and then we can ask RD to investigate. I believe that information is stored in a cookie. If you have in the settings to not track and accept cookies or have a software to clear it periodically then that could be the reason. Seems like I've noticed some changes to the text reply box on the forum recently. I've also noticed the messages don't remain marked on the Recent list, but I thought it was either an Edge cookie issue, or because I often re-image my C: drive, and that messes up all kinds of cookies. Maybe the RD gurus can take a look and see if they might be able to help boost the forum's short term memory. OK, this is getting strange. I just logged in today, and the Forum "memory" of what I have read in other Forums here is just fine since yesterday, EXCEPT, it did not show the unread posts for this topic in this Forum ... ? It showed this Forum as read. I have not done any updates, program installs, or cleaned out any cookies/caches. I will continue to monitor the situation, which is no issue for me, since I come here every day anyways. Thank you all for your very prompt suggestions and feedback. We have asked CyberLink RD to look into it. Hopefully they can find some answers. Thank you for looking into this matter. 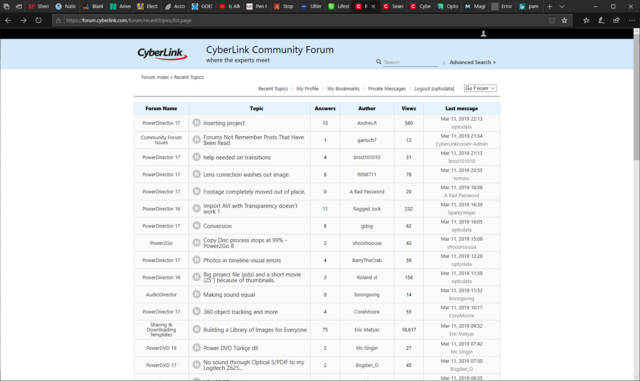 Again today, when I logged in, this Forum indicated no unread responses in this Forum, but I had not yet read your post (the most recent in this Forum). 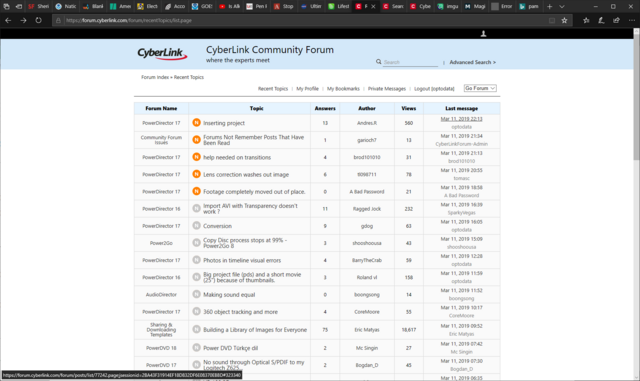 The PD17 Forum is still indicating unread messages that I have "read" by marking "all as read". The situation is greatly improved since I first reported the issue in this Topic, but there is obviously an erratic "gremlin" at work on these Forums. Happy hunting. Thank you and have a great day. The problem seemed to be resolved for a few days, but now it is recurring and my list of unread topics in the Forums is growing daily. Good luck in tracking down this bug. Today when I logged in, the Forums "remembered" what I had previously marked as read. This seems to be an erratic bug. Just an update. I am still having the problem of the Forums not remembering posts that I have read. We made an adjustment in settings and contune to monitor the forum on various computers and browsers. We also recommend clearning out your browser cache from time to time to see if that yields better results on your personal computer. Thank you for your efforts to resolve the issue. I have cleaned my Chrome browser cache and will continue to check to see if my read posts are "remembered".